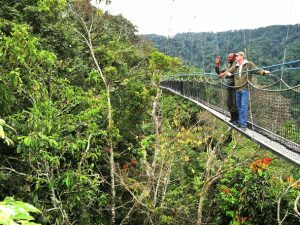 This 5 days Rwanda gorilla safari Volcanoes national park & Nyungwe canopy walk is a 5 days Volcanoes gorilla trekking safari Rwanda and Nyungwe canopy walk introducing you to the best safari activities in Rwanda. This exclusive gorilla safari Rwanda features a gorilla tracking experience in Volcanoes National Park Rwanda, canopy walk in Nyungwe forest national park and a Kigali city tour. Your professional Rwanda safari guide will pick you up from Kigali international airport upon arrival on day 1 of your 5 days trip in Rwanda using a 4×4 safari Land cruiser and drive you to an accommodation facility of your preference prior booked close to Nyungwe forest national park where you will have dinner and an overnight stay. The next day, you wake up to an early morning breakfast then transfer to the park headquarters for chimpanzee trekking for about 4 hours, have a lunch break and then return for an evening canopy walk. After a rest in the night, you will spend the third day of your trip relaxed as you transfer from Nyungwe forest national park to Volcanoes national park where you do gorilla trekking the next day then after do a Kigali city tour on the last day and depart. 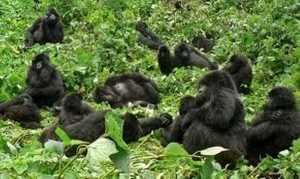 You will spend a bout 2-6 hours trekking mountain gorillas and a single memorable hour in the sight of the gorillas. 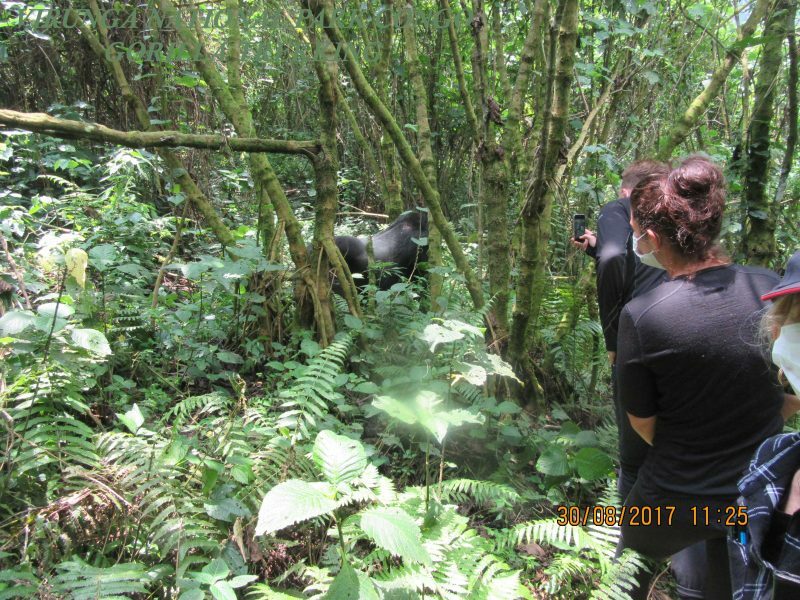 You will require physical strength to get along in the forest since the park is forested, this safari is perfectly planned to make sure you have the most out of all your safari in Rwanda activities. Day 1: On arrival at Kigali international airport your knowledgeable driver guide will transfer you by road on a 4×4 safari vehicle to an accommodation facility near Nyungwe forest national park. Day 3: Your driver guide will transfer you from Nyungwe forest national park to Volcanoes national park. Day 4: You will do gorilla trekking in Volcanoes national park starting at 8:00am lasting about 2-6hours in the jungle. From the moment you set foot in Kigali international airport, your professional driver guide will pick you up to start your safari. Your driver guide will drive you past beautiful sceneries for about 193km to a lodging facility close to Nyungwe forest national park. Here you will have dinner, relaxation and an overnight stay. 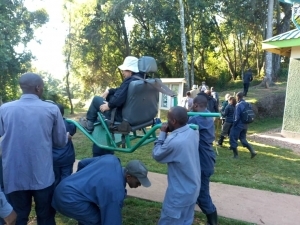 After a memorable breakfast from your accommodation facility in Nyungwe forest national park, you will head to the park headquarters on a Rwanda wildlife safari for chimpanzee trekking. 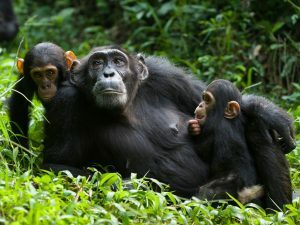 Chimpanzees are our closest relatives sharing about 99% DNA with humans. You will be stunned by the way the chimps play around the trees with their human like characters. 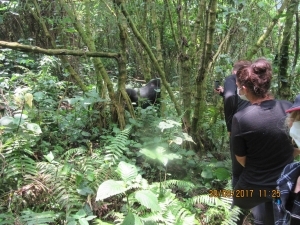 Passing through the jungle, hiking in the steep slopes amidst several sightings will offer you the best 2-5 hours chimpanzee trekking. 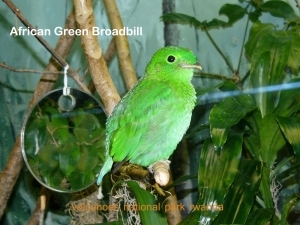 In the afternoon after your lunch, you will now visit the canopy of the forest that you explored early in the morning. Walking 50m above the ground for 200meters is a breathtaking experience you cannot compare to any other canopy experience. These 2 hours walk to and from starts and ends at the Uwinka tourist reception center at the park headquarters. While you are up there very many bird species will be passing by but just keep your eyes up to avoid getting scared from the height. Remember to wake up early such that you can’t miss any moment on this day of your Rwanda gorilla safari. Gorilla trekking briefing starts at 8:00am at the park headquarters therefore you have to be there before this time. 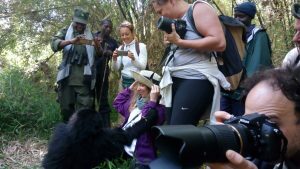 During the briefing, you will be allocated a gorilla family to trek along with 7 other trekkers and informed about the gorilla trekking etiquette. 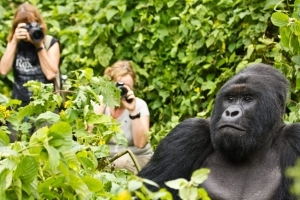 Gorilla trekking lasts about 2-5 hours though you can only gaze the gorilla life style for only 1 hour. Since every great moment comes to an end, this last day of your safari ends with a Kigali city tour. You will be driven to Kigali city for a visit to the city including the Gisozi genocide memorial center where you will have chance to learn about the history of Rwanda especially the 1994 genocide. After lunch, your driver guide will drive you back to Kigali international airport for departure. 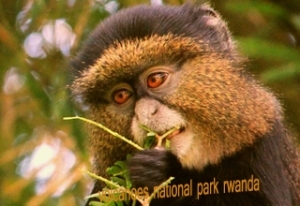 Volcanoes National Park Rwanda is the only home to mountain gorillas in Rwanda along with other mountain gorillas in Virunga national park and Mgahinga gorilla national park for Congo gorilla safaris and Uganda gorilla trekking safari tours respectively. Spend 5 days discovering the beauty in the forest within the jungle and have a chance to sight the forest from above on this single safari.